Adolph was born Gustav Adolph Bönitz on 8 February, 1829, in Endingen, Baden, Germany, a son of master dyer Johann Bönitz and Barbara Herb. Like most of his siblings, he emigrated to the Americas. Alexander, Carolina, Karl, Lugarda, and Theodor were founding members of the Colonia Tovar in Venezuela, Barbara emigrated to Texas, whereas Adolph and his older brother Louis were miners in the American west during the gold rush era. In the US Census of 1910, Adolph claims to have arrived in the US in 1851. From his cousin Wilhelm’s letters (excerpted below) we know Adolph and Louis roamed the gold mines from British Columbia, Canada, to Mazatlán, México. 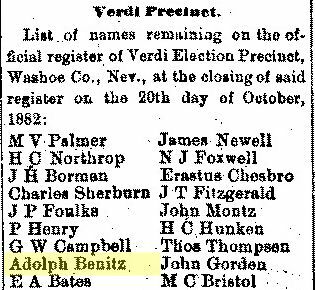 Adolph Benitz is listed in the First Directory of Nevada, 1862, as a “miner” at Crown Point Ravine in/near Gold Hill. Adolphus Benitz came to see me last July. He came from Columbia and the mines. At the same time his brother Louis arrived from Mazatlán (Mexico) they both went together up to the river Fraser, New Caledonia [north of Yale, British Columbia, Canada]. 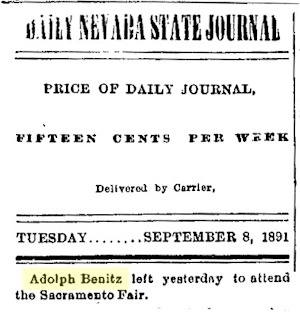 Louis and Adolphus Benitz are also at the mines of Washoo [between today’s Reno and Lake Tahoe, Nevada, USA], but I don't get much news from them. Perhaps I will go there myself next spring to buy shares in a few mines. Louis Benitz and Ziegler went to Sonora in Mexico [per reference to Washoo, more likely Nevada]. 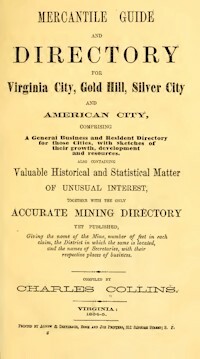 Louis is headman of a silver-mine there, which belongs to a German Company at San Fco. Ziegler sent me a little box full of Washoo minerals he brought from there. 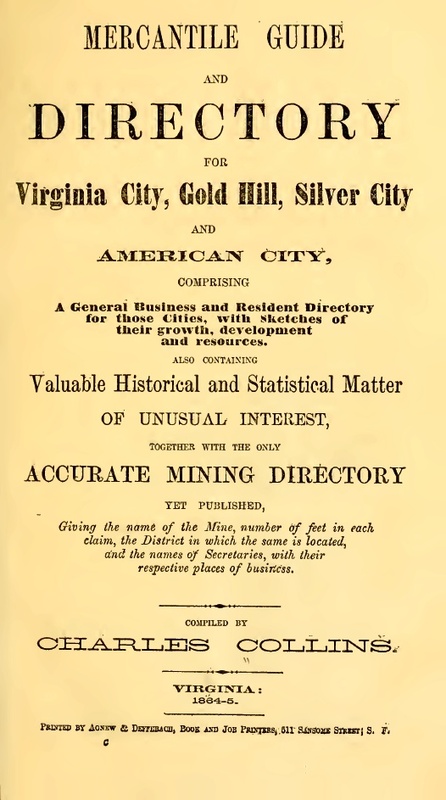 I have heard little from Adolphus L.
The US tax records of 1864 and 1865 show Adolph operated an “Eating House” in Gold Hill, Nevada: he paid taxes $3.33 and $11.11 respectively. 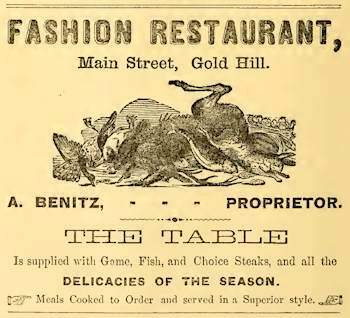 And, he placed an advertisement for his “Fashion Restaurant” in the Mercantile Guide and Directory for ... Gold Hill ... (see below) of 1864-5. We do not (yet) know his exact dates of ownership. 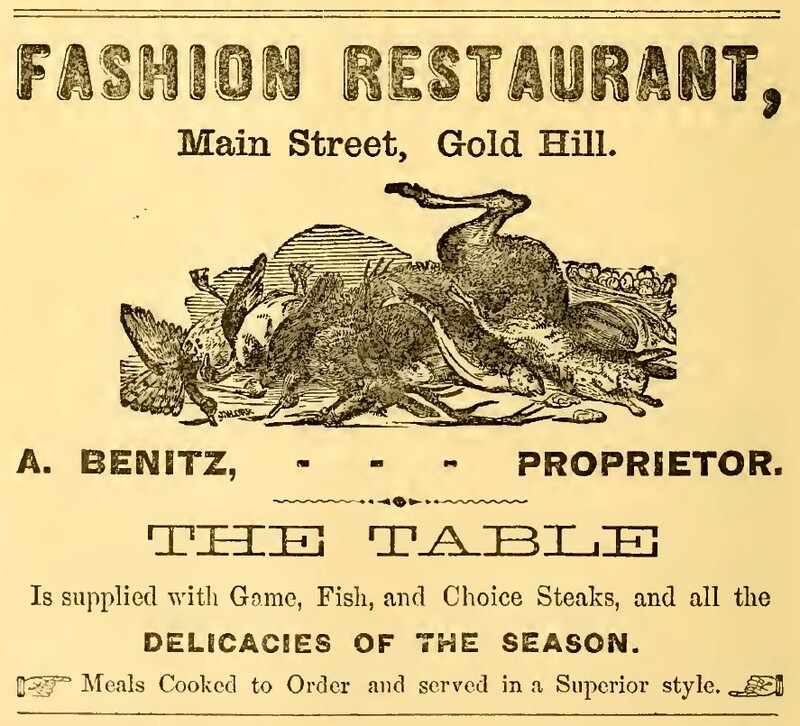 Advertisements in San Francisco and Sacramento newspapers for similarly named “fashion” restaurants, indicate they all served a wide variety of fish and game to the well-heeled. 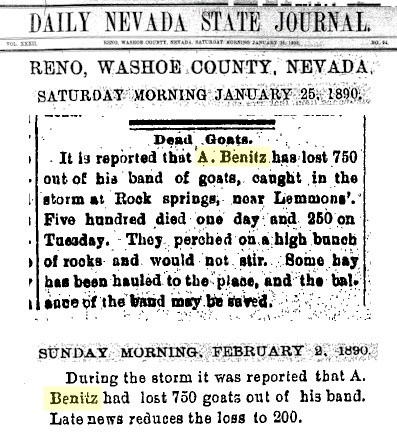 The Nevada census of 1875, lists A. Benitz as a farmer in Washoe County, age 45, from Germany, and not married. In the 1880 U.S. census he is listed as Adolf, single, farmer, age 57, from Germany. Per that census, he had a farmhand, Odett, C.A., single, 18 years old, from Canada; living at the farm but was unemployed for 12 months of the census year. 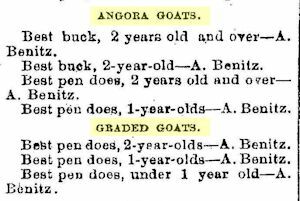 From newspaper articles (see below) we know Adolph became a successful prize-winning Angora goat breeder. 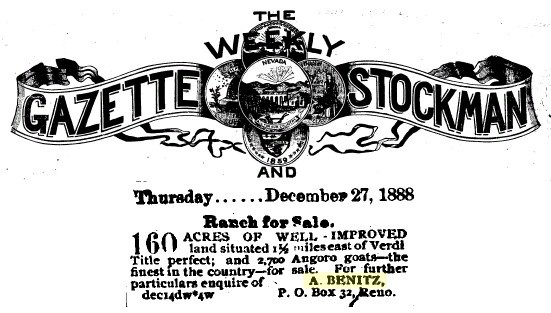 According to the advertisiment for the sale of his land in 1888 (see below), he owned a 160 acre farm 1½ miles east of Verdi, Nevada; and his herd of Angora goats numbered 2,700 head — far more than could be carried on 160 acres. 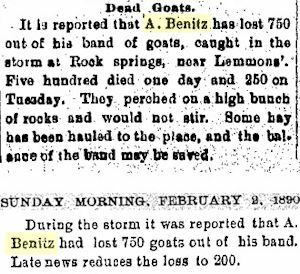 Two articles (see below) mention he had a herd of goats at Rock Springs, 7 miles north of Reno. 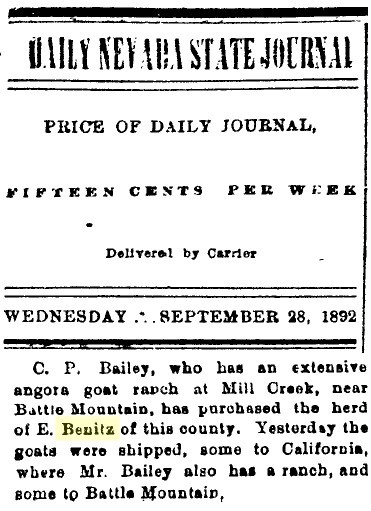 Neither article specifies whether he owned or rented the land on which the herd was located. 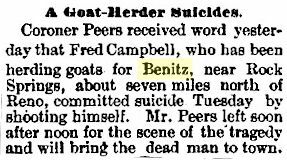 He sold his goats in September, 1892. Presumably soon after that sale he moved to San Francisco. 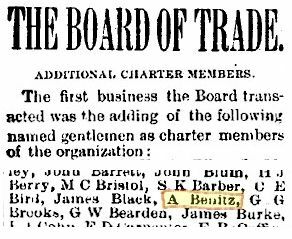 1894 - Benitz, Adolph: lodging or in furnished rooms, at 145 Fourth Street & 766 Howard Street. 1898 - Benitz, Adolph: lodging at 147 Fourth Street & 776 Howard Street. 1901 - Benitz, Adolph: lodging at 303 Third Street. 1908 - Benitz, Adolph: rooming at 418 College Avenue. 1912 - Benitz, Adolph: rooming at 418 College Avenue. 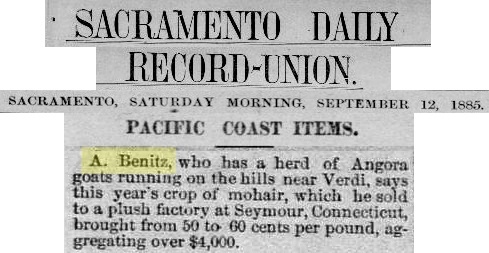 The US census of 1900 includes Benitz, Adolph, single, living at 303 Third Street, head of household and occupation “Lodging house keeper”; he rented the house in which he lived. The census also shows he was born in Germany in Feb. 1829 (age 71); dates of immigration and naturalization are unknown; he could speak, read, & write English. He had one lodger, Bliemiester, Charles, single, occupation: laborer. Bliemiester was born in Germany in 1862 (age 38), immigrated to US in 1890, and could speak, read, & write English. 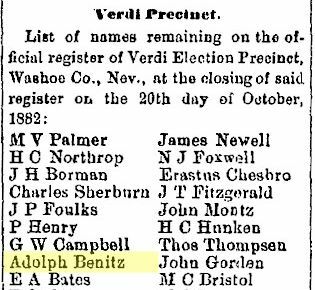 The US census of 1910 includes Benitz, Adolph, single, living at 418 College St., head of household, with no occupation; he owned his house and it was mortgaged. The census shows he was born in Germany and was 81 years old; he entered the US in 1851 and was naturalized; and he could speak, read, & write English. He had a lodger, Benson, Jann, single, occupation: street laborer, employed but was without work 8 weeks in 1909. Benson was 51 years old, born in Sweden, arrived in the US in 1874; and he could speak, read, & write English. Per the California Death Index, Adolph died September 12, 1912, at 418 College Avenue. He was 83 years old. Click the image of an excerpt to view more of the article from which it was taken. and Waxes Fat on a Sage Brush Diet. Complete List of Persons Receiving Premiums. 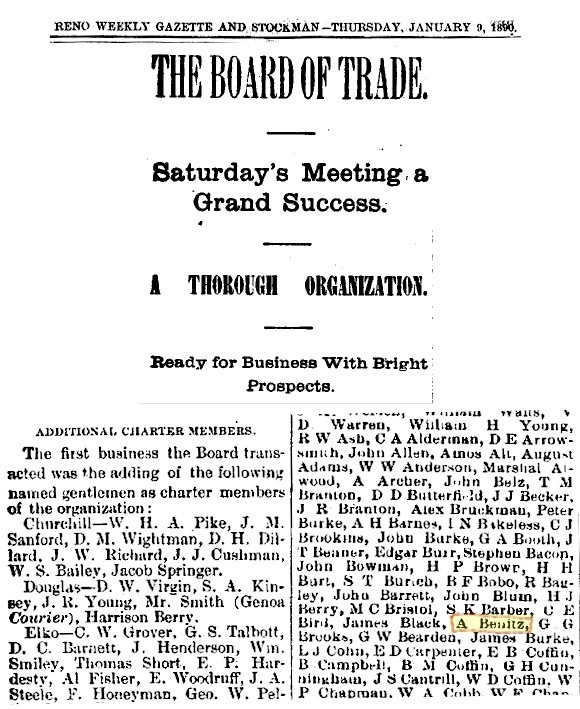 Saturday's Meeting a Grand Success. Ready for Business With Bright Prospects.